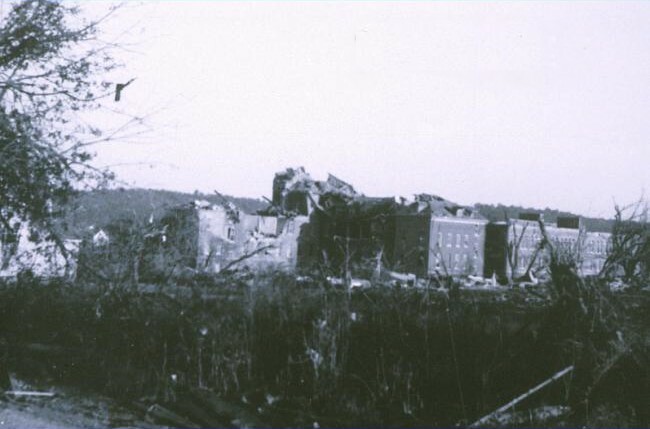 Damage at Assumption College (now Quinsigamond Community College) from the Worcester tornado of 1953. Today [June 9, 2017] is the 64th anniversary of the great tornado of 1953. The tornado touched down in Petersham at 4:25 p.m. It remained on the ground for 84 minutes, tossing debris for up to 50 miles; “Chunks of soggy, frozen mattress fell into Boston Harbor,” according to islandnet.com. John DiPietro interviewed survivors for a three-part series in 2013. The tornado spawned multiple books, including John O’Toole’s 1993 work “Tornado! 84 minutes, 94 lives” and John Bisol’s “The Worcester Tornado: A New Perspective” from 2015. Residents recount the day here. The city of Worcester has a slideshow of 108 photos. Newsreels recounted the disaster, two videos of which are below. A YouTube video by user crownbaker has color footage from the Burncoat area before and after the tornado. This headline makes the mistake that many news articles make about the tornado. The damaged building pictured is not Assumption College but Assumption Preparatory School for Boys. The school gave the new college some space to use while their college campus was being developed on Salisbury St. Few news articles get this right. I’d never heard this before. Thanks! I wish we knew more now.